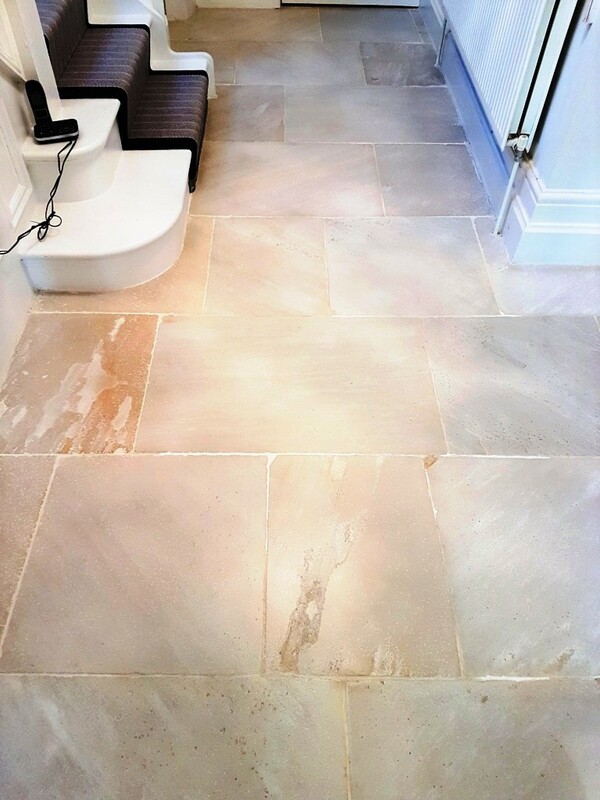 This floor is London White Limestone which is a very expensive but stunning stone that costs around £60 per square metre. 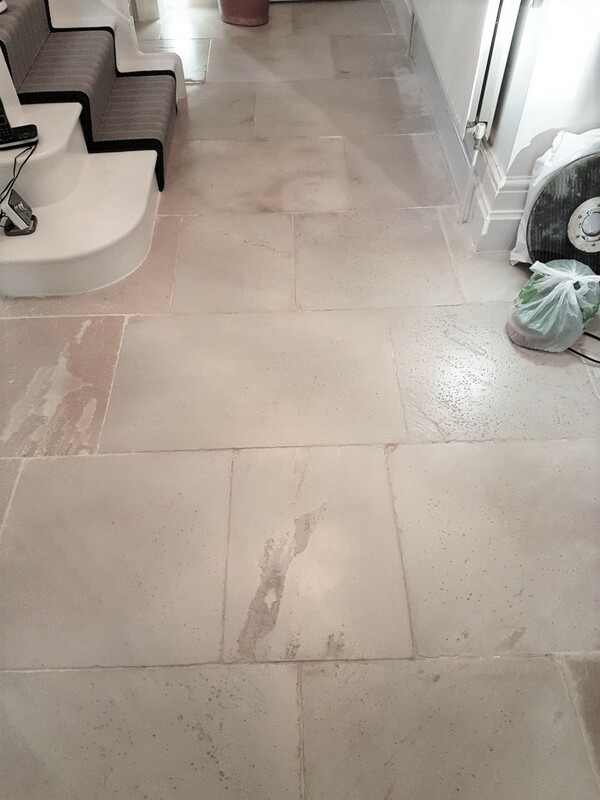 It’s a pale stone that has a wonderful texture and aged appearance that makes it quite unique. 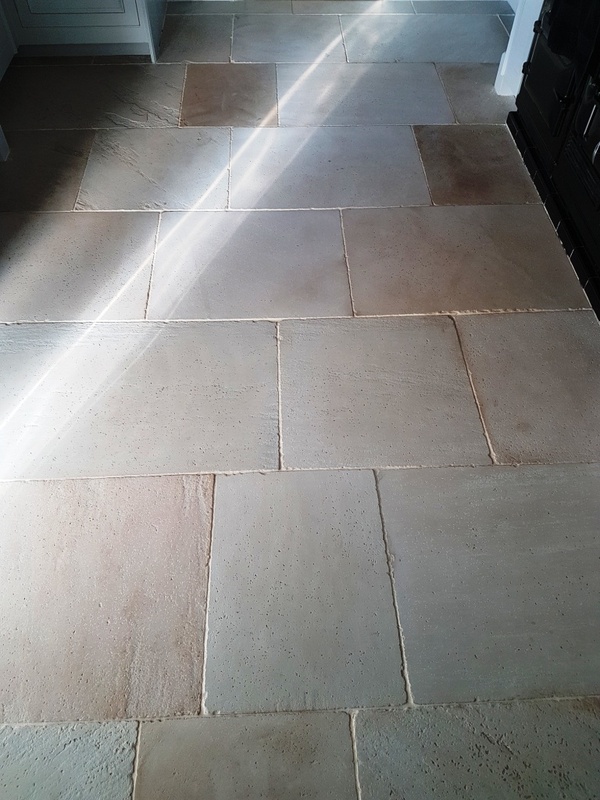 Unfortunately, however being a pale stone, it didn’t photograph well, especially in low light so apologies in advance for the poor photographs. 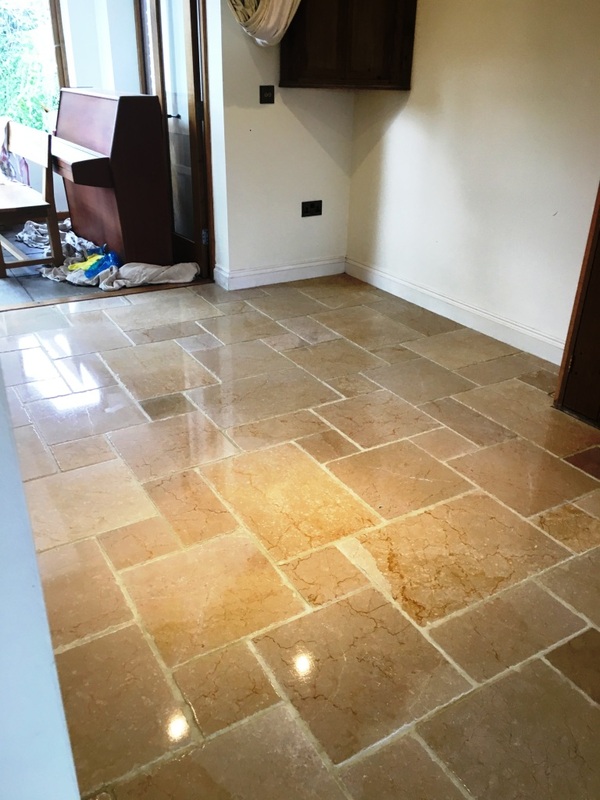 The stone was installed in a very large area across much of the ground floor of this stunning house in the North Yorkshire spa town of Leyburn. 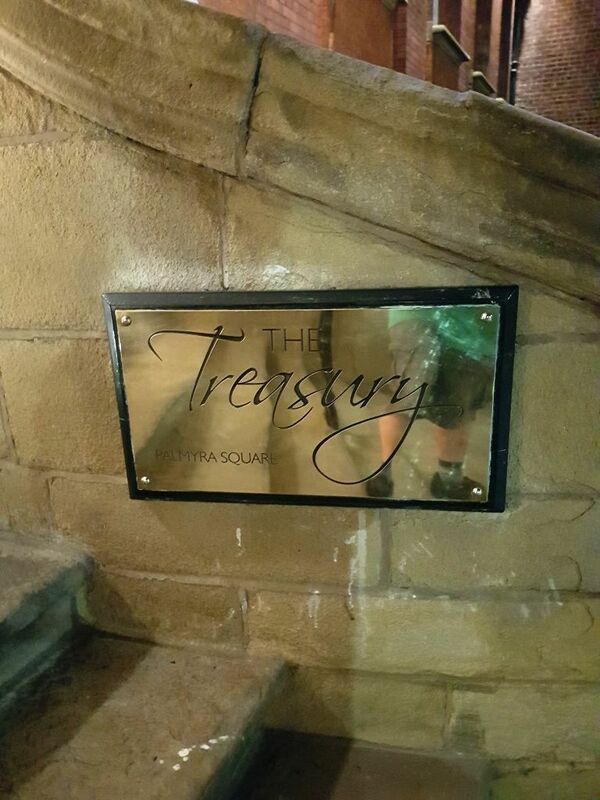 The property was in the centre of the town which is just 13 miles from the Yorkshire Dales National Park. 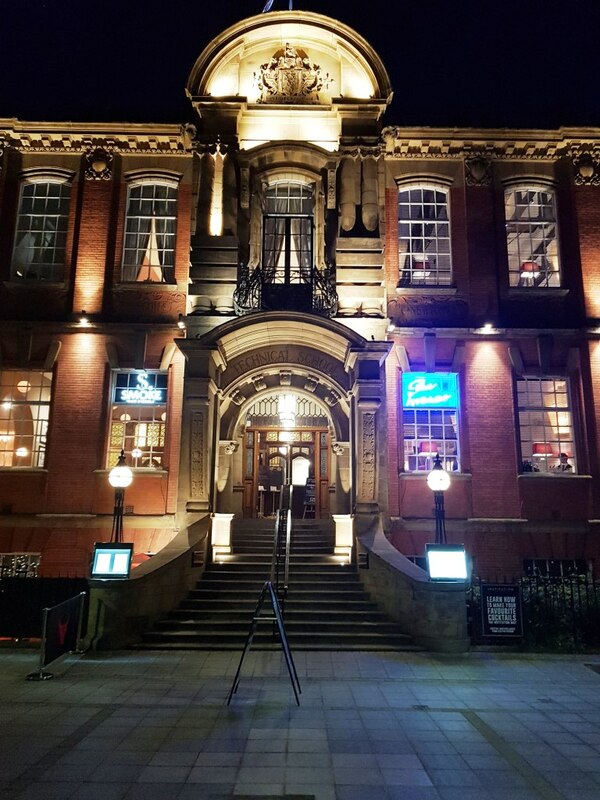 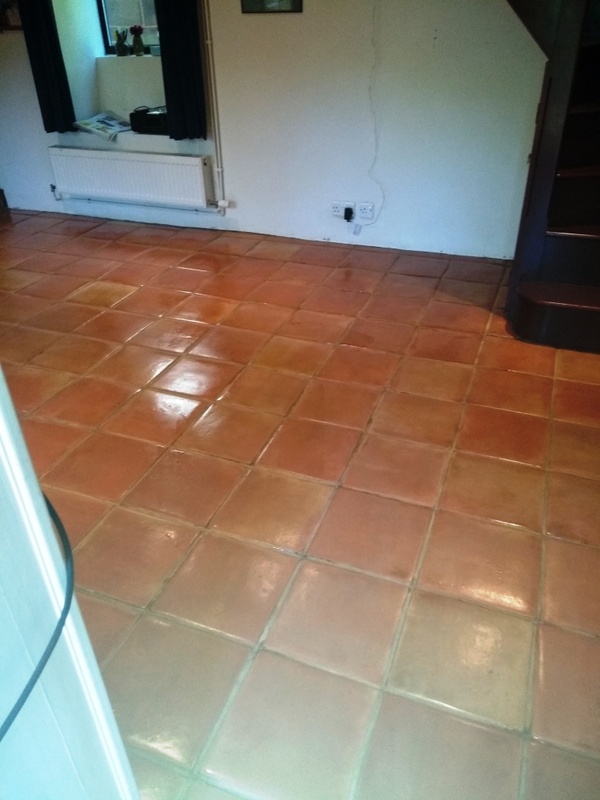 There were four areas in total that needed attention, two of which were still quite clean, the main areas that needed attention were the high traffic areas around the entrance hall and kitchen which needed a full clean. 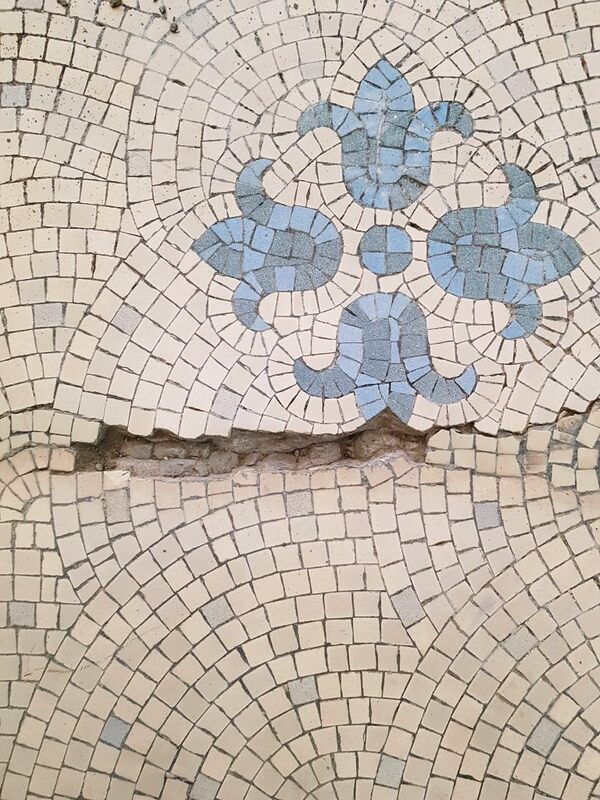 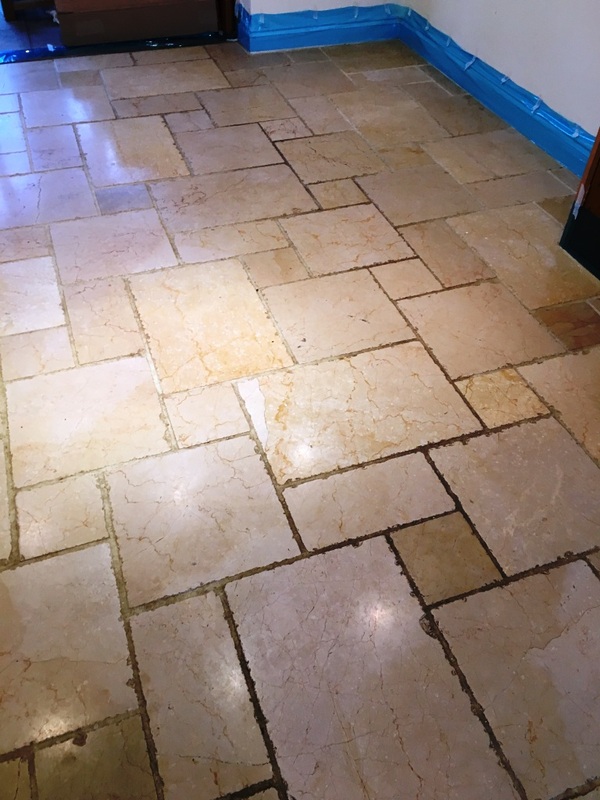 The sealant had started to break down and with the stone being white, the floors were looking a bit dirty and drab. 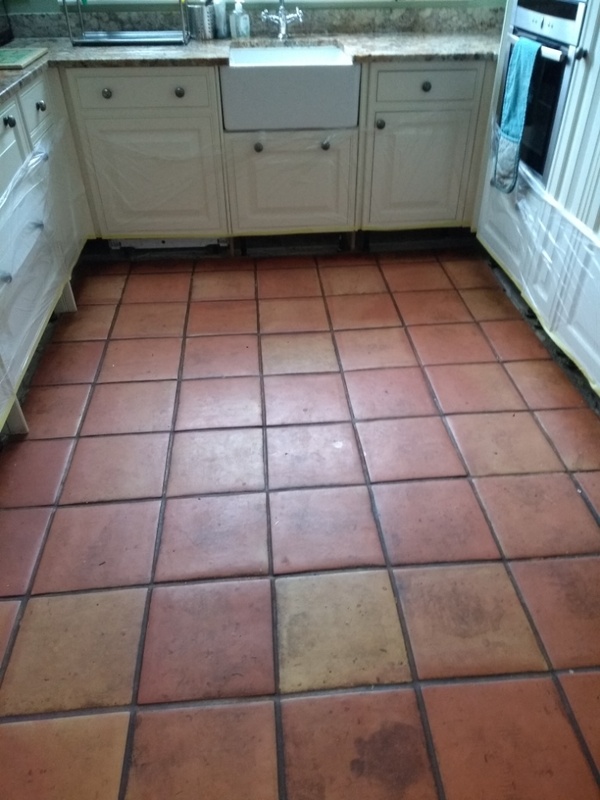 The two other rooms were only laid around a year ago and were still clean and unmarked however due to the state of the other floors the customer was concerned about the original sealer that had been used and so I agreed to top up the seal in these rooms with a different product to add more protection. 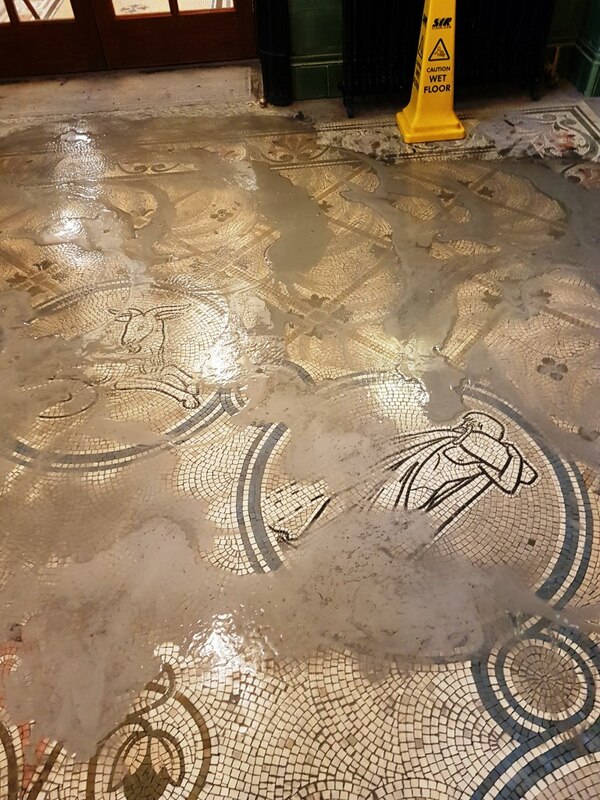 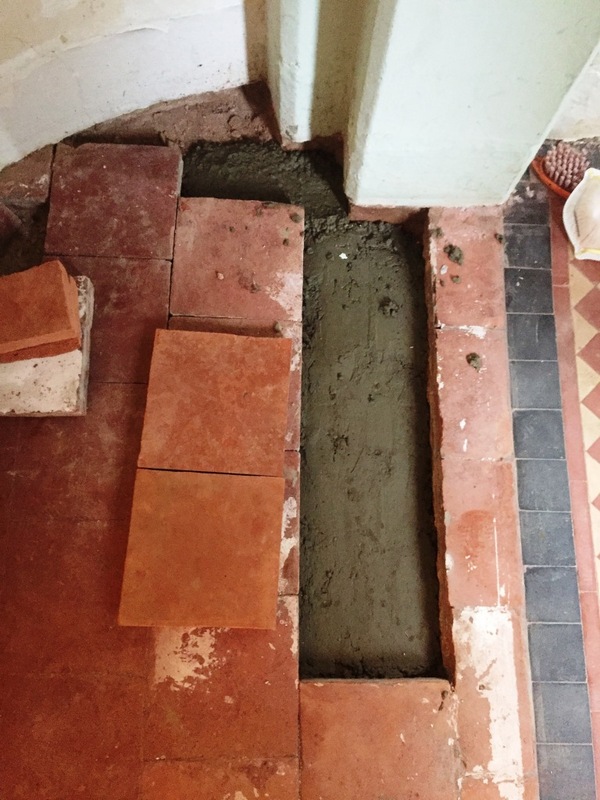 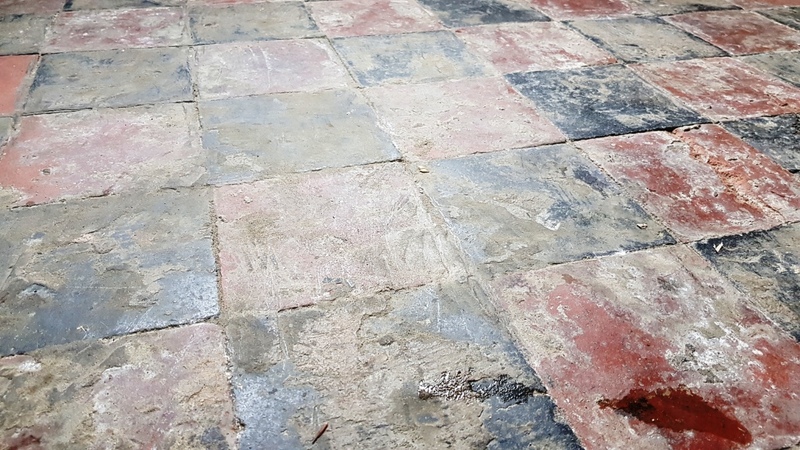 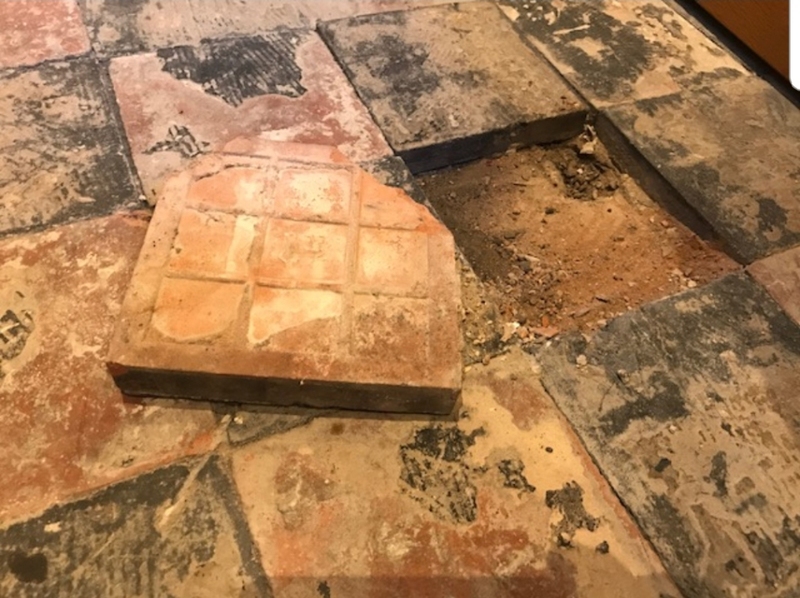 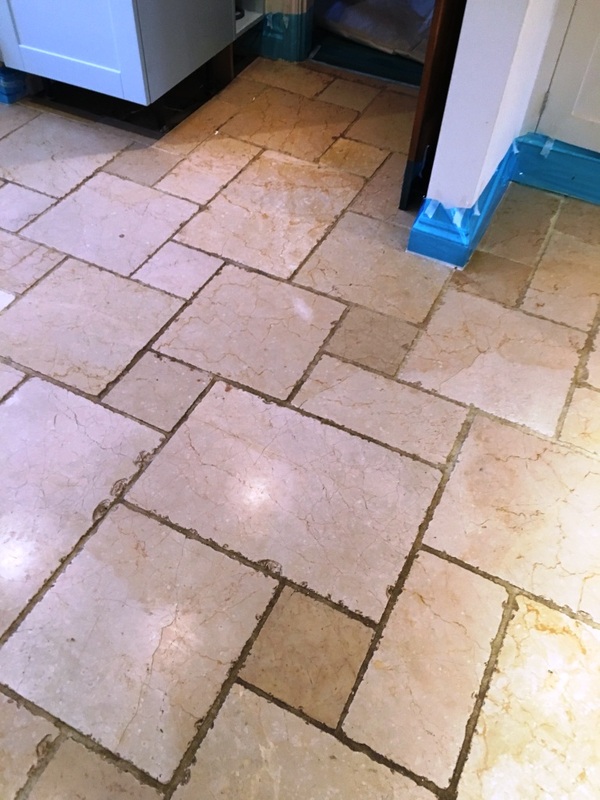 Lithofin Stain-Stop had been used previously which from my experience isn’t up to sealing Limestone properly, so l said l could apply a more effective sealer which would penetrate the existing and provide more protection. 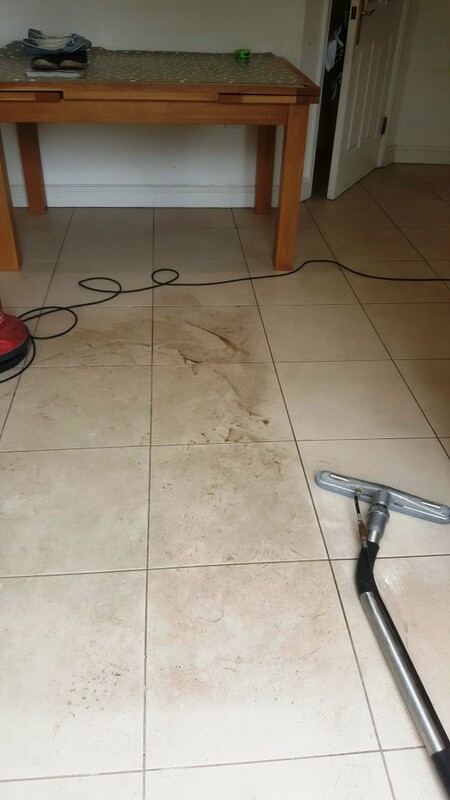 To make matters worse the client had been using household cleaners which weren’t suitable for cleaning a sealed floor. 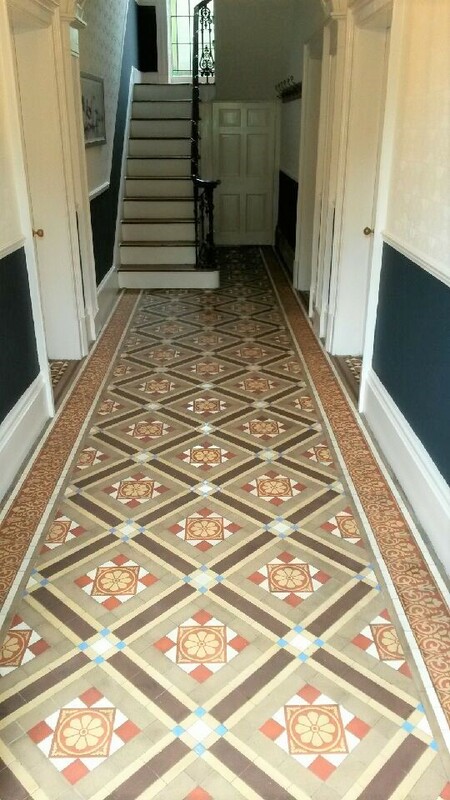 We agreed a price for the work to be carried out, which the client was happy with, the work was scheduled in for a few weeks later. 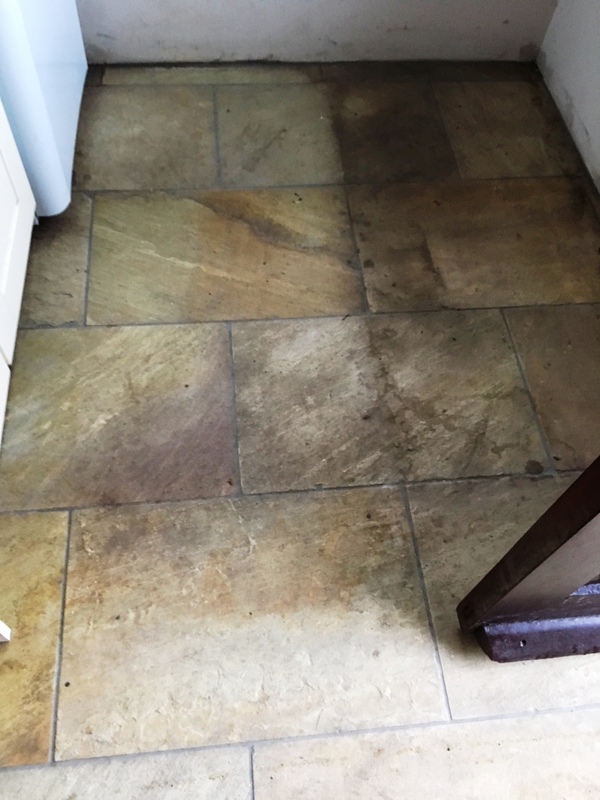 After adding protection to the skirting boards, I started cleaning the stone in the entrance and kitchen areas. 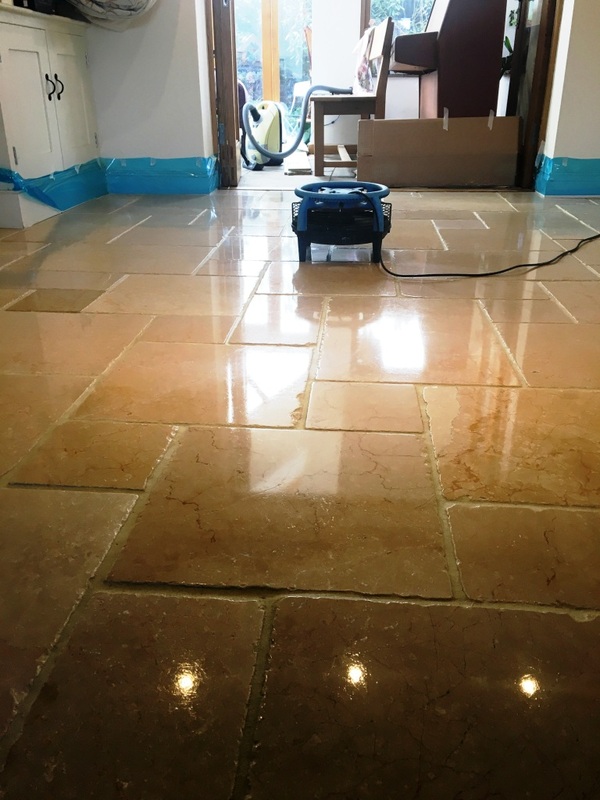 I find you get the best results on Limestone by applying a series of Diamond encrusted honing pads which clean and hone the stone. 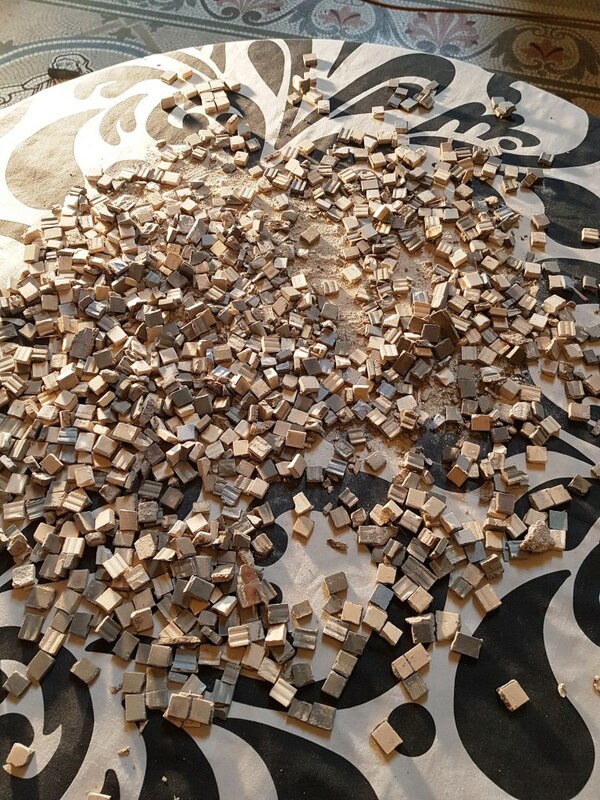 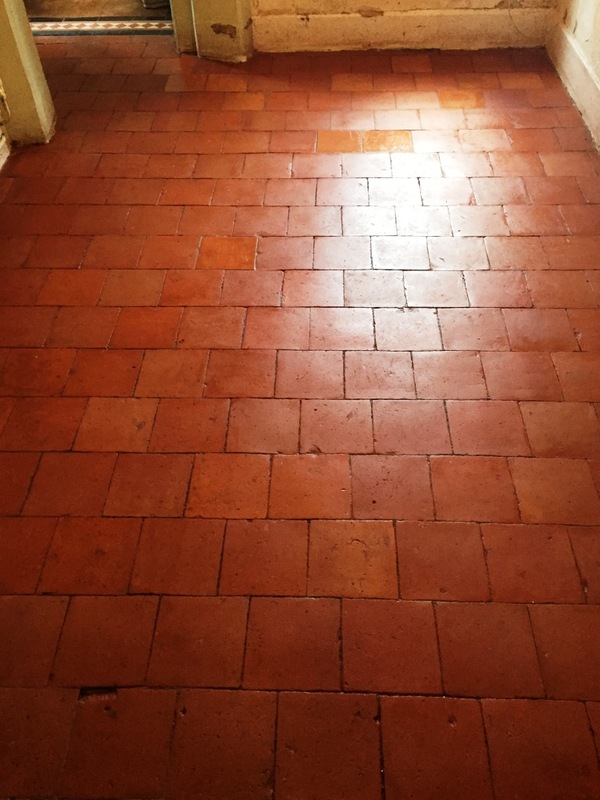 They are applied in sequence starting with a coarse 400-grit pad followed by the medium 800-grit and then fine 1500-grit pad. 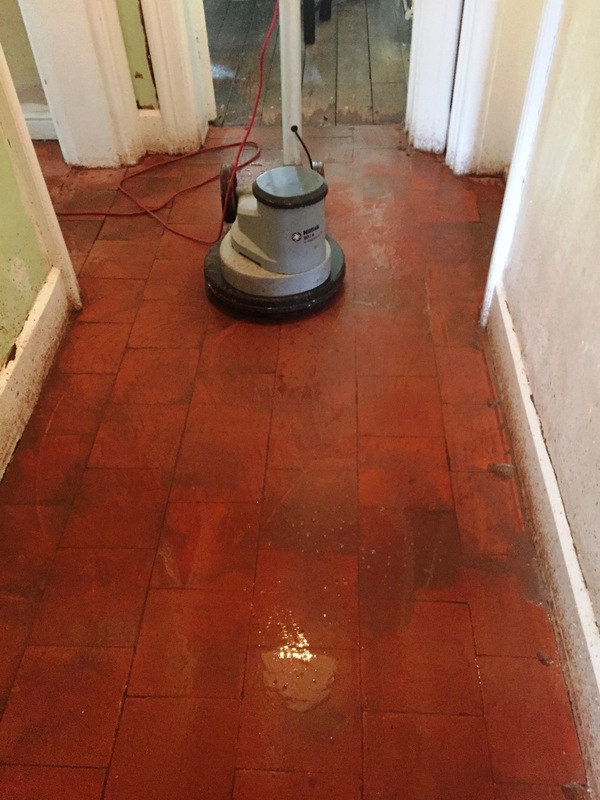 The pads are applied with water to provide lubrication and the floor rinsed in between the application of each pad with the soil being extracted with a wet vacuum. 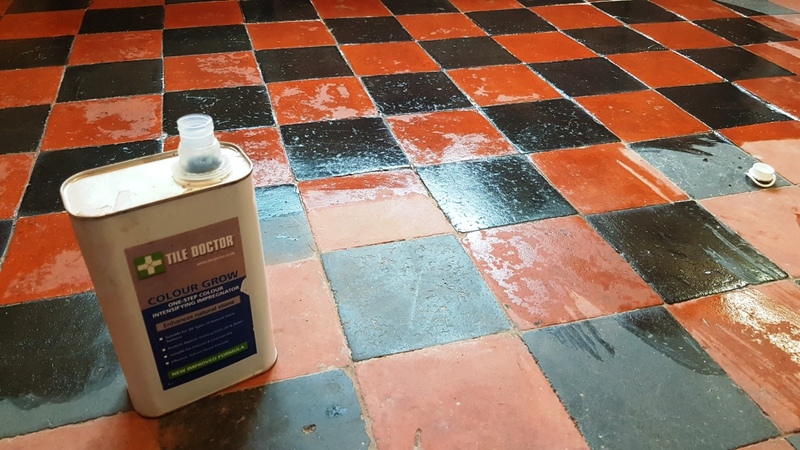 If you have read any of my other posts, you are would probably be expecting me to follow-up the burnishing process with a 3000-grit polishing pad however that wasn’t required in this case as we only use that on polished stone to achieve a deeper shine. 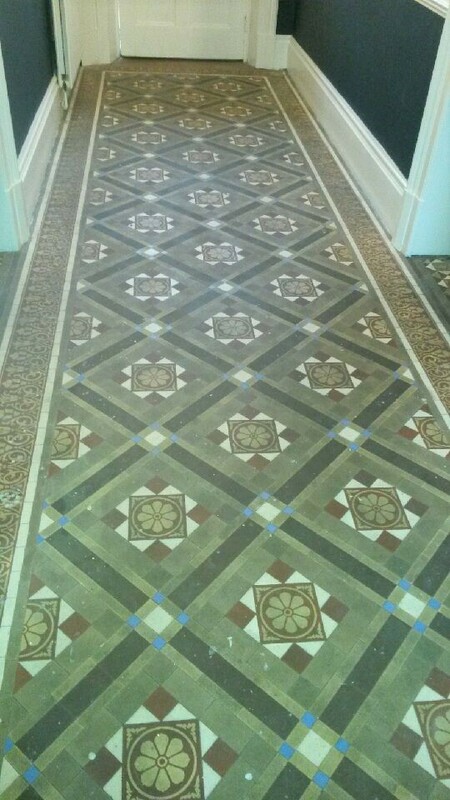 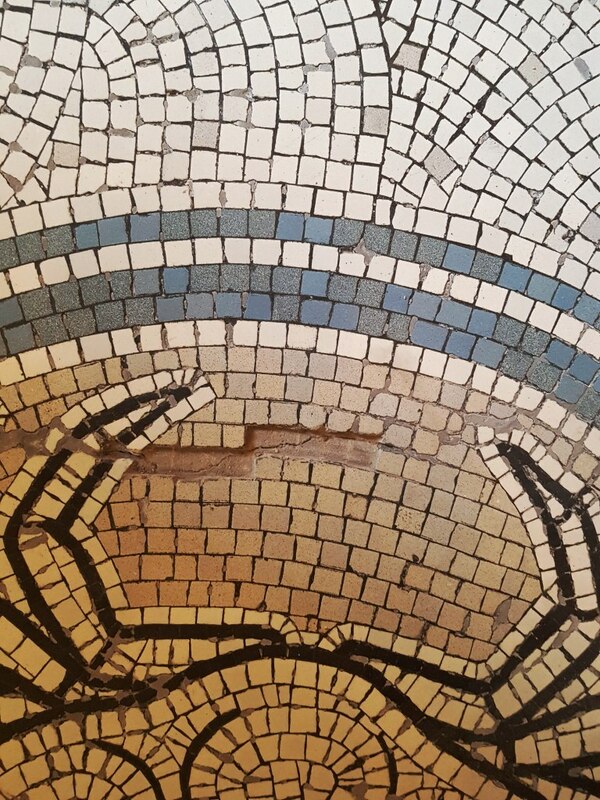 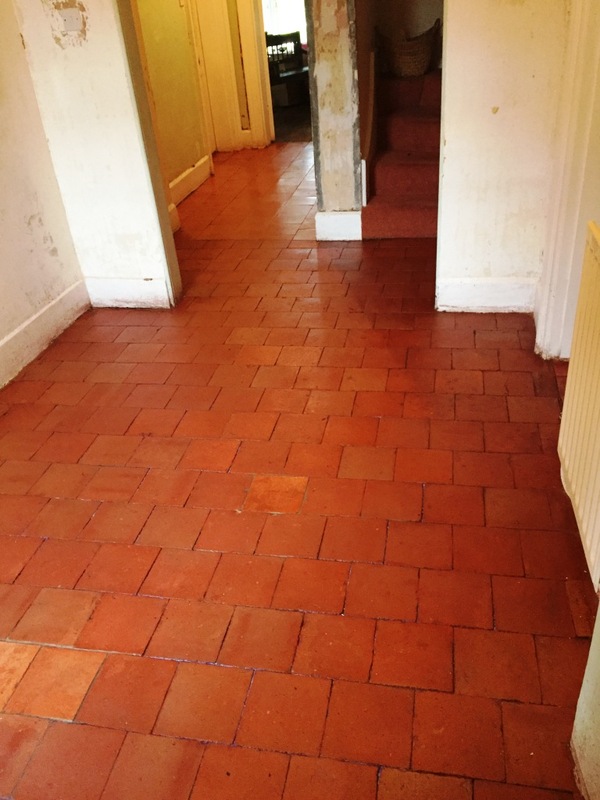 The immediate result was a lightly polished floor which looked much brighter than before. 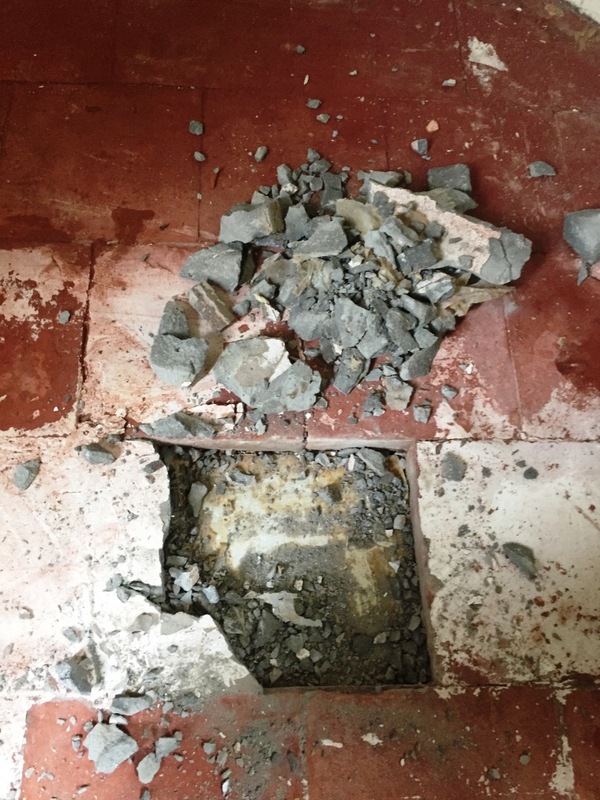 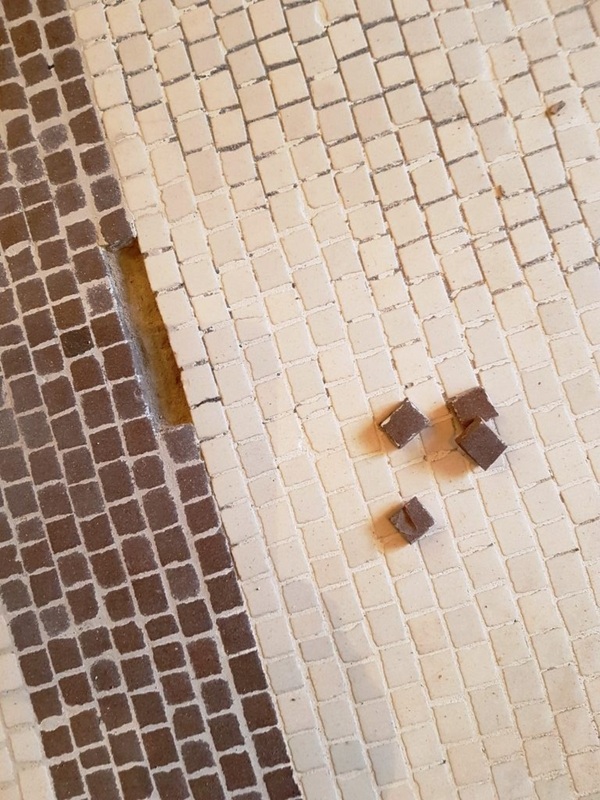 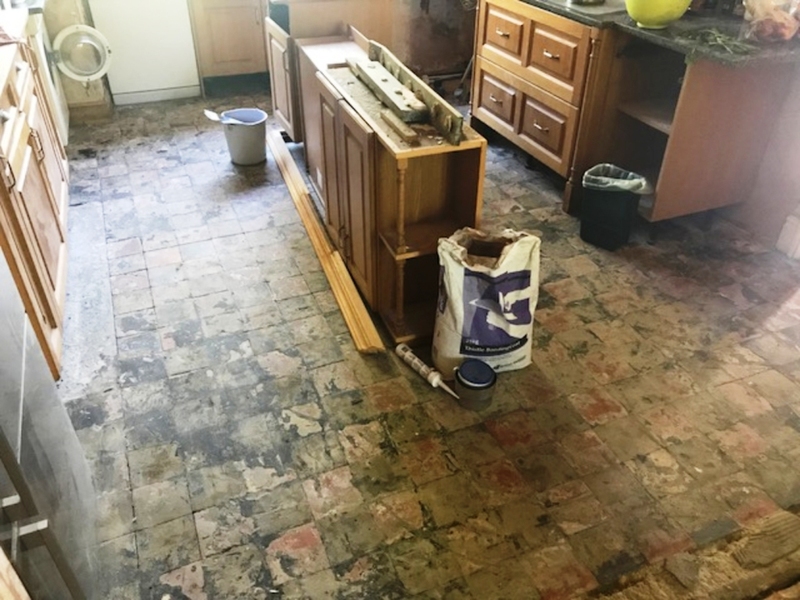 The floor was left overnight to dry off, I double checked with the moisture meter that the previously cleaned area was dry and then all four areas were sealed the next day using a couple of coats of Tile Doctor Ultra-Seal. 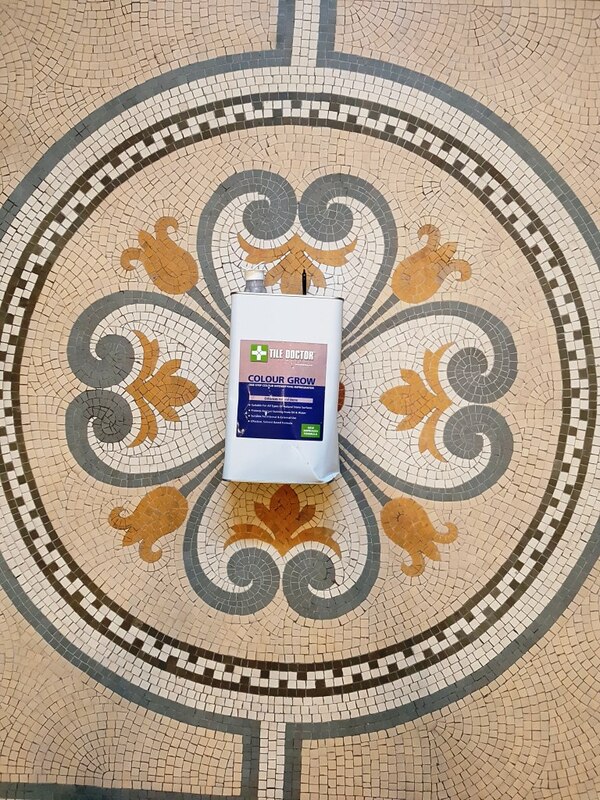 This is a premium, no-sheen, natural-look, solvent-based penetrating sealer which is created to provide maximum stain protection without changing the appearance of the beautiful stone floor. 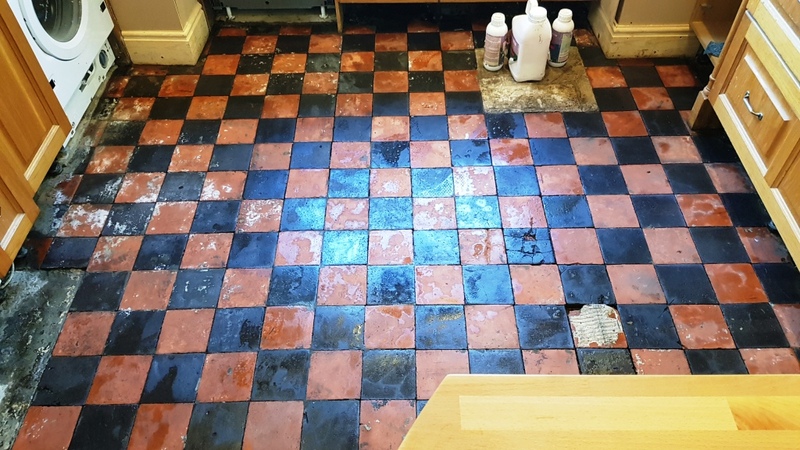 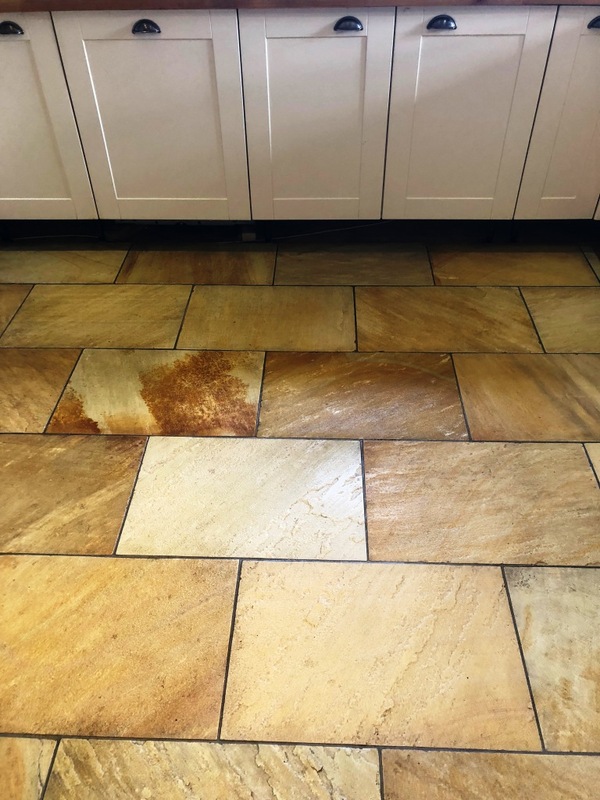 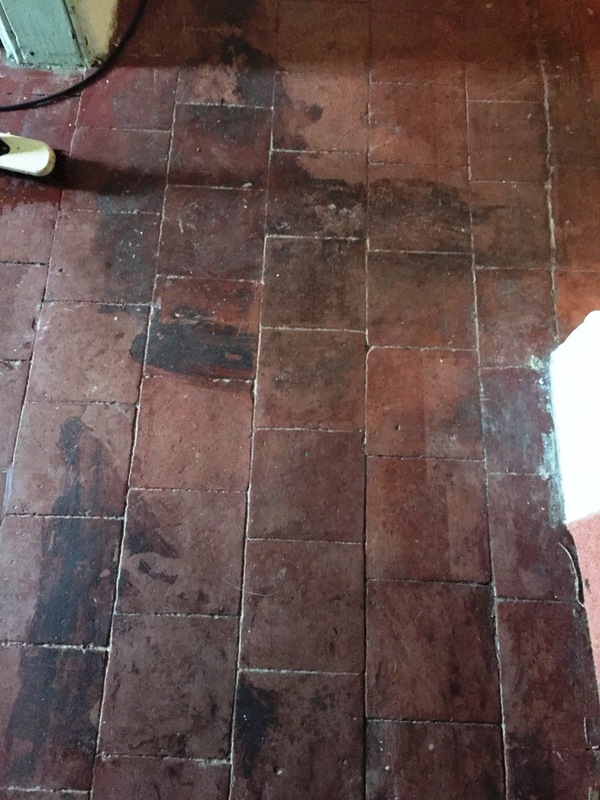 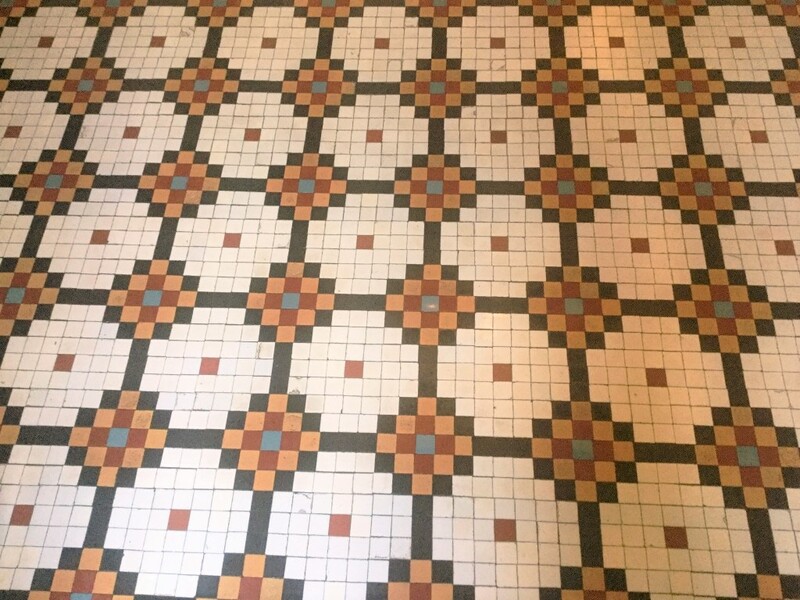 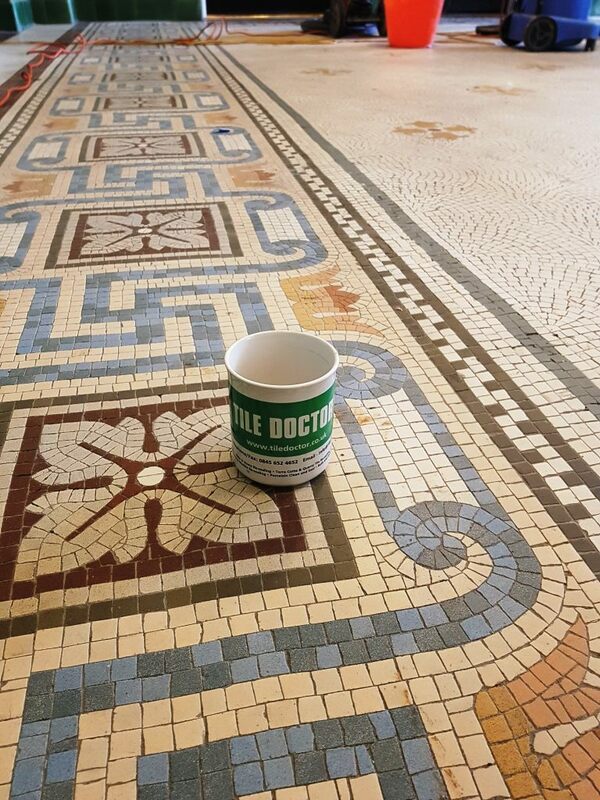 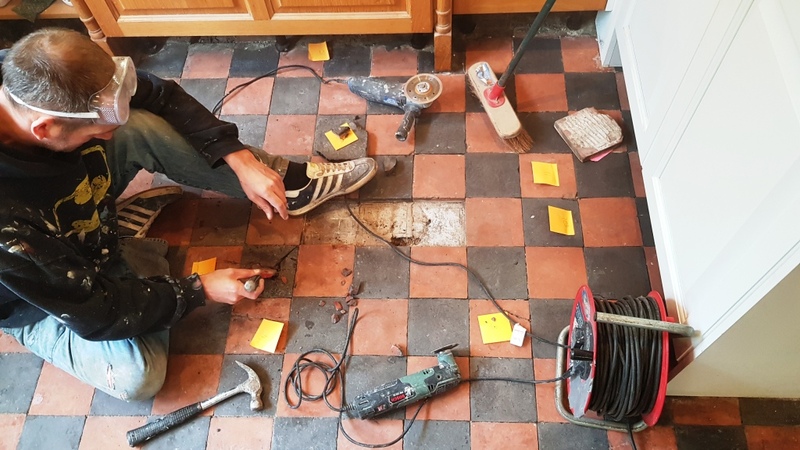 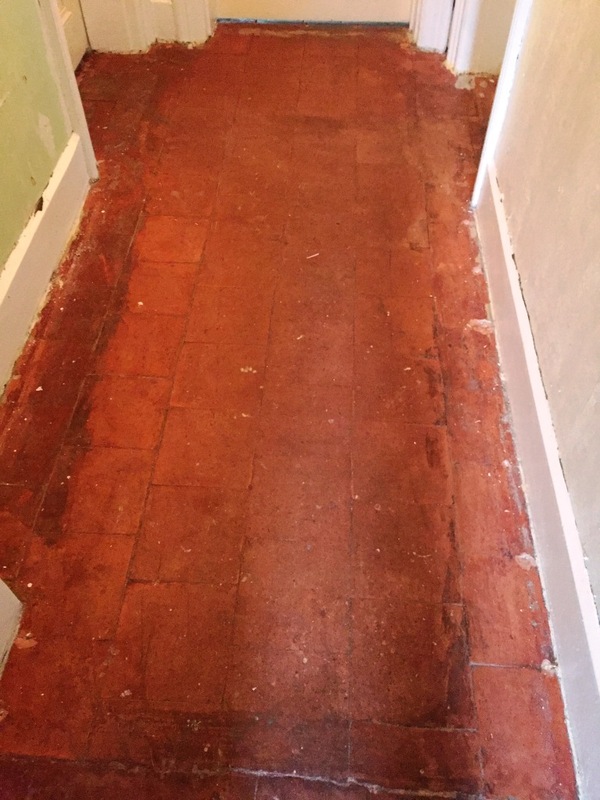 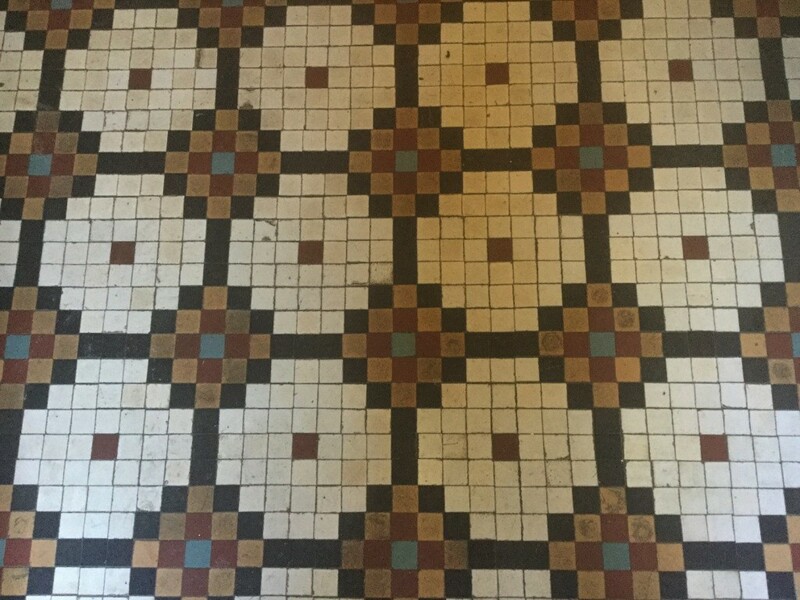 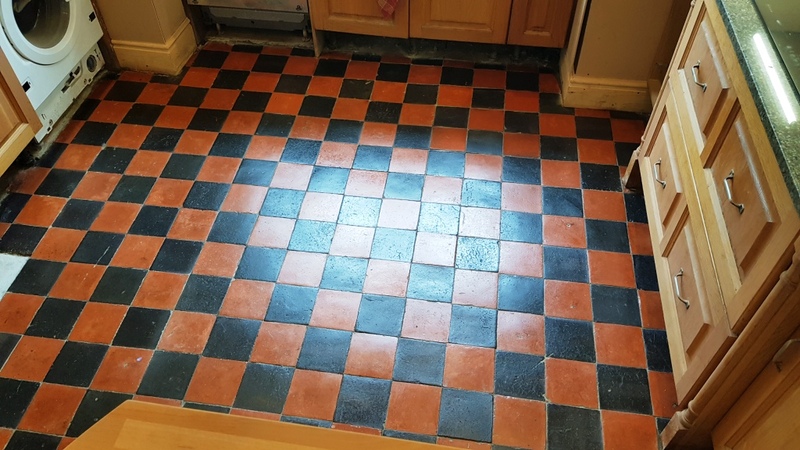 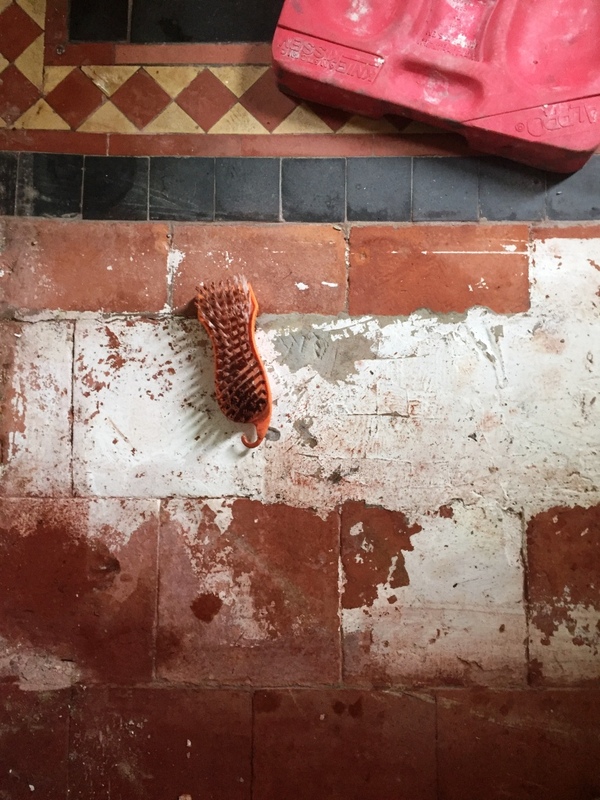 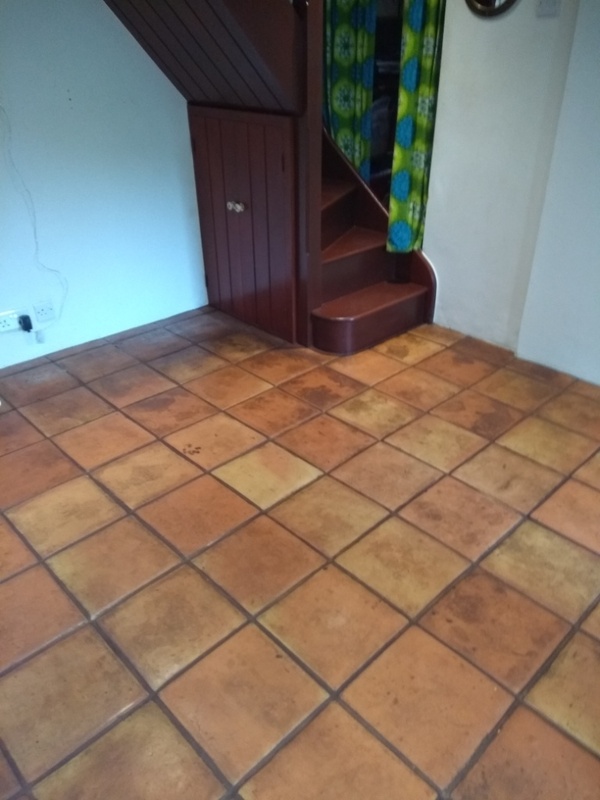 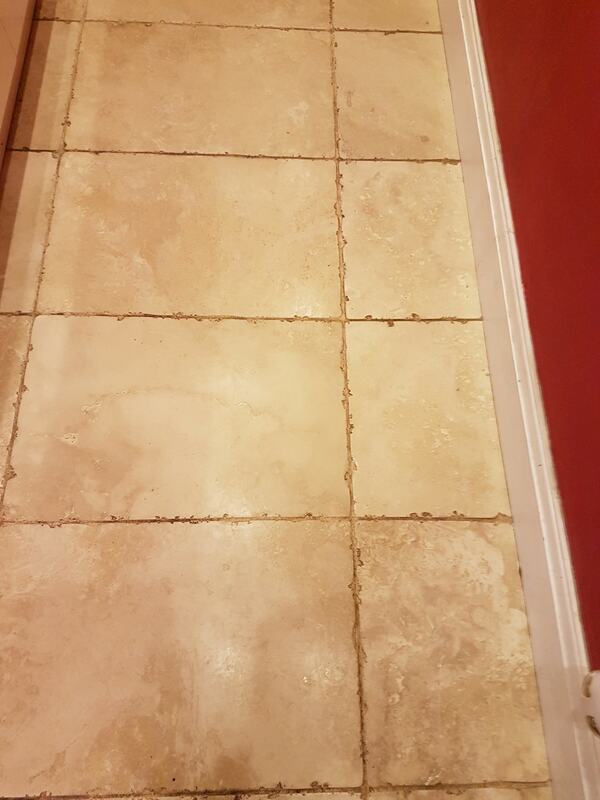 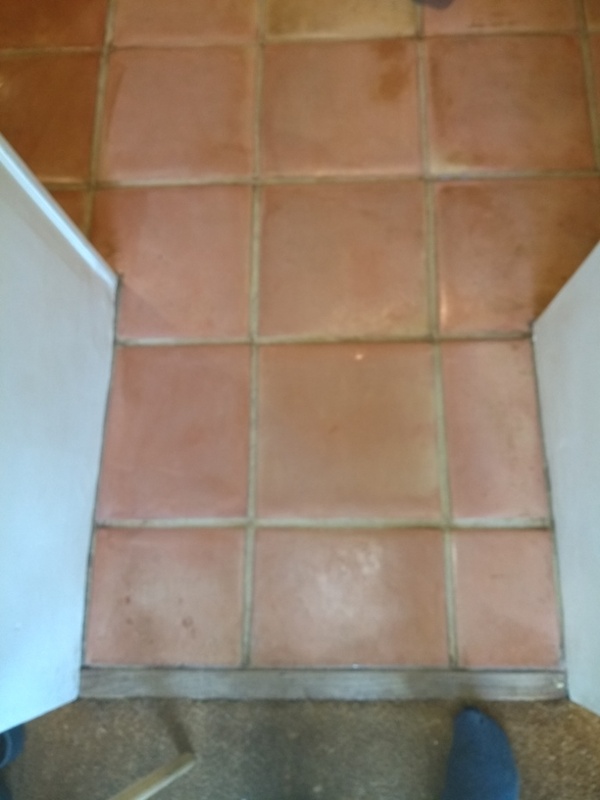 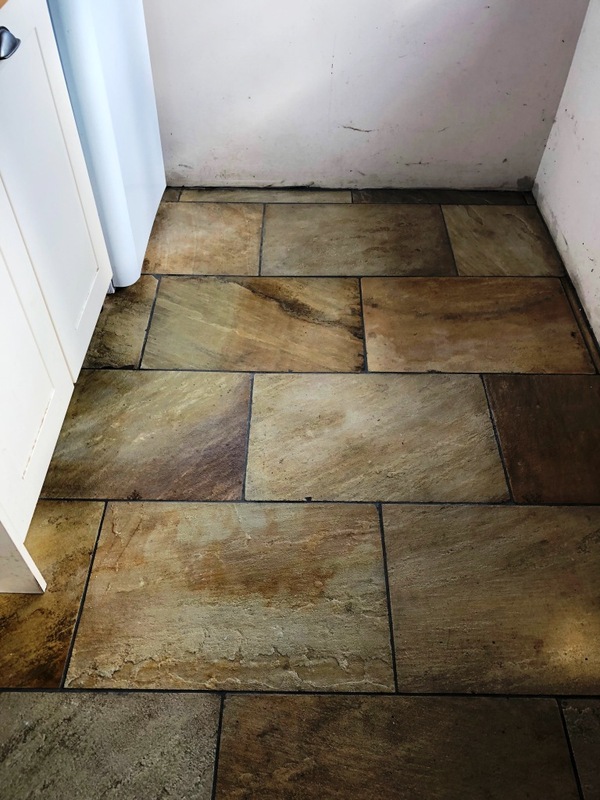 For after care I recommended to my customer the use of Tile Doctor Stone Soap which will clean the floor without prematurely eroding the sealer. 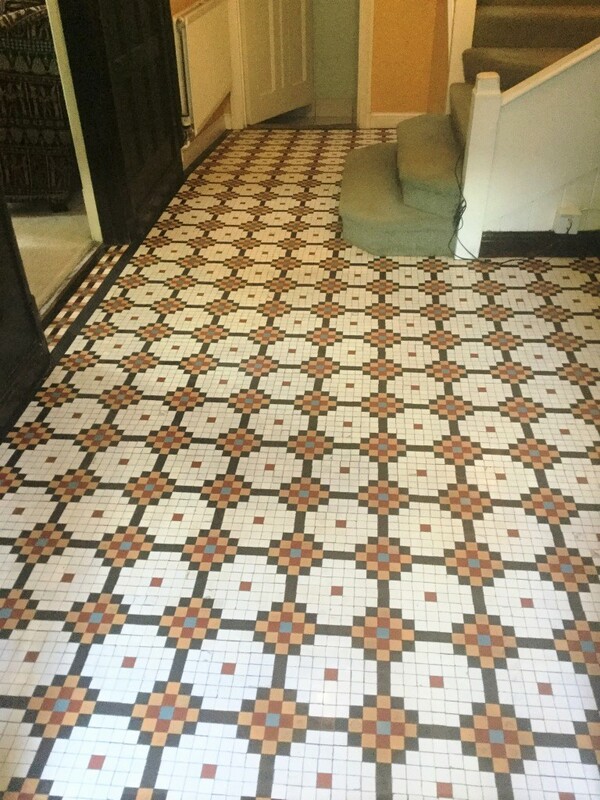 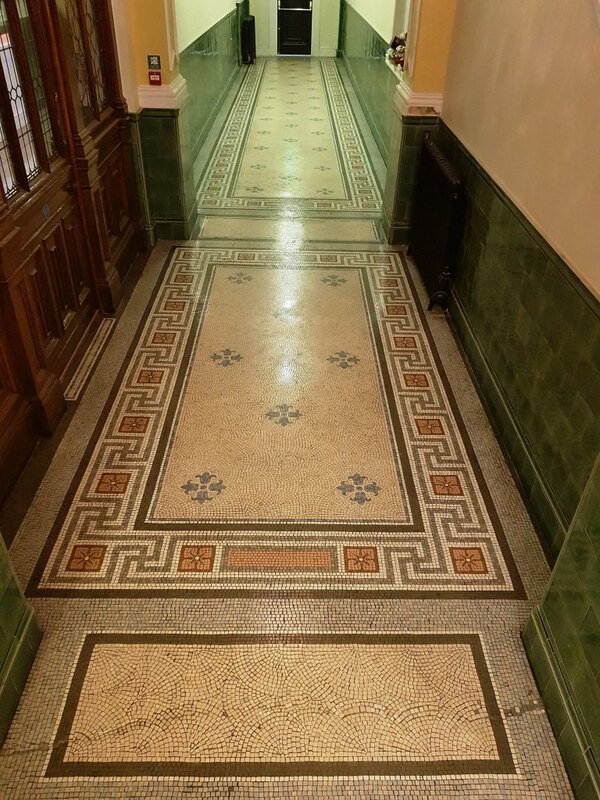 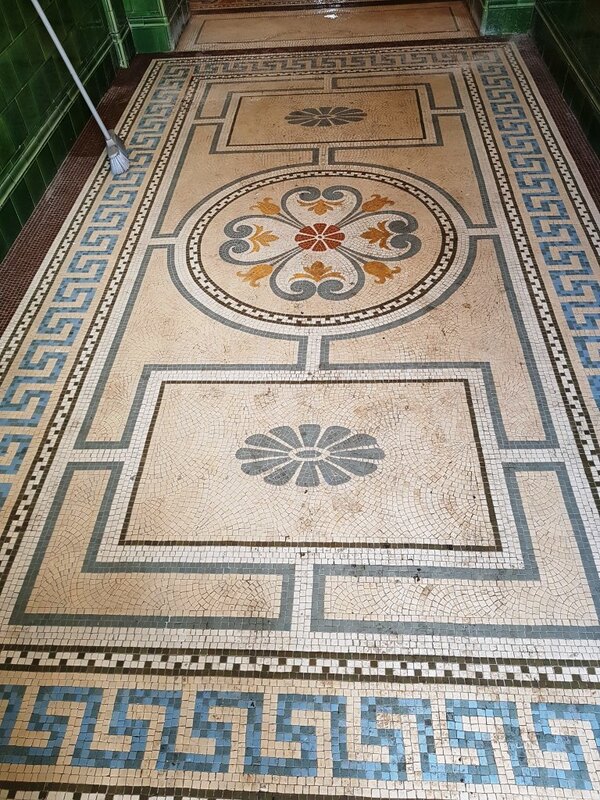 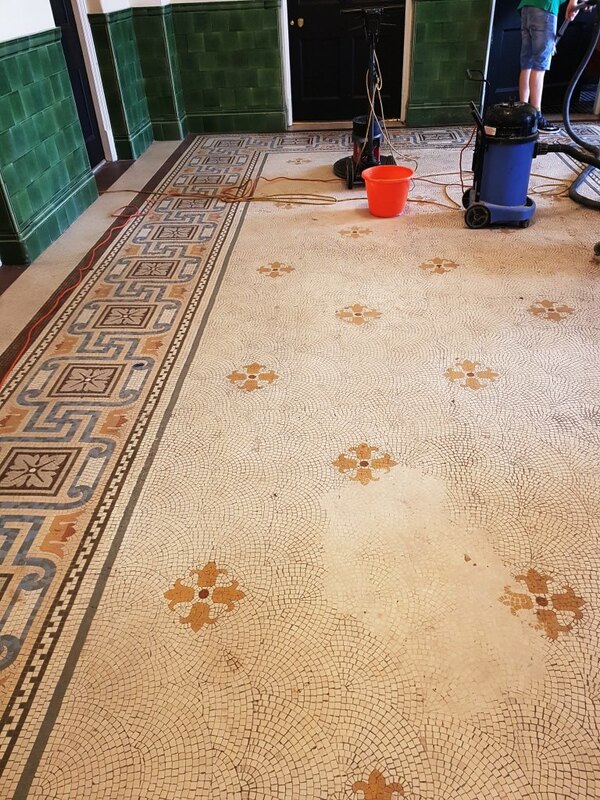 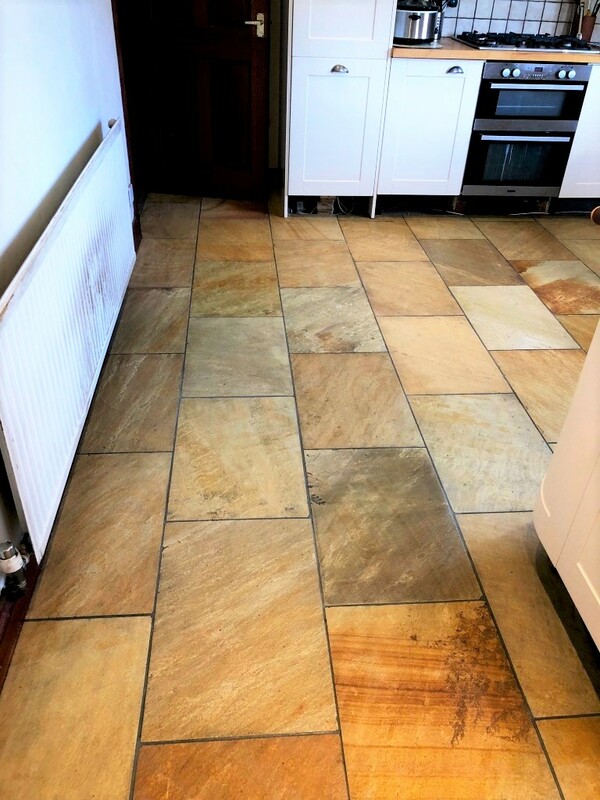 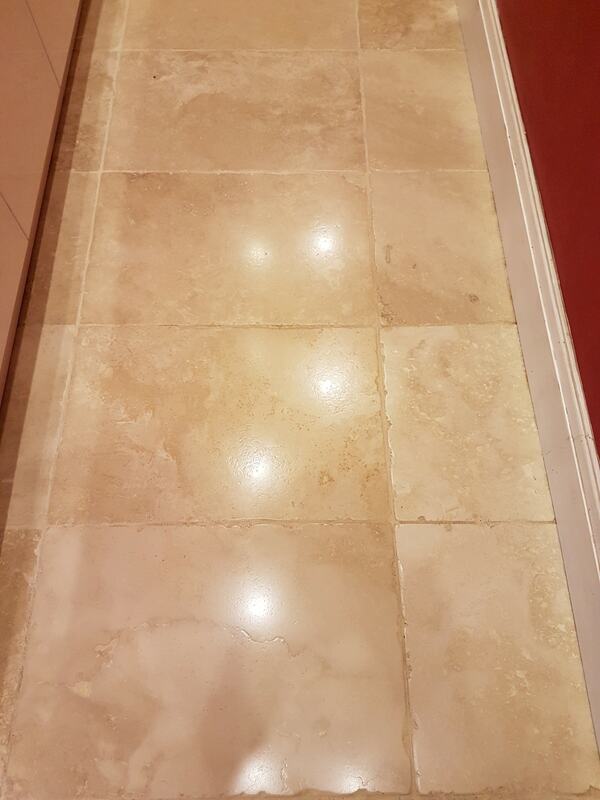 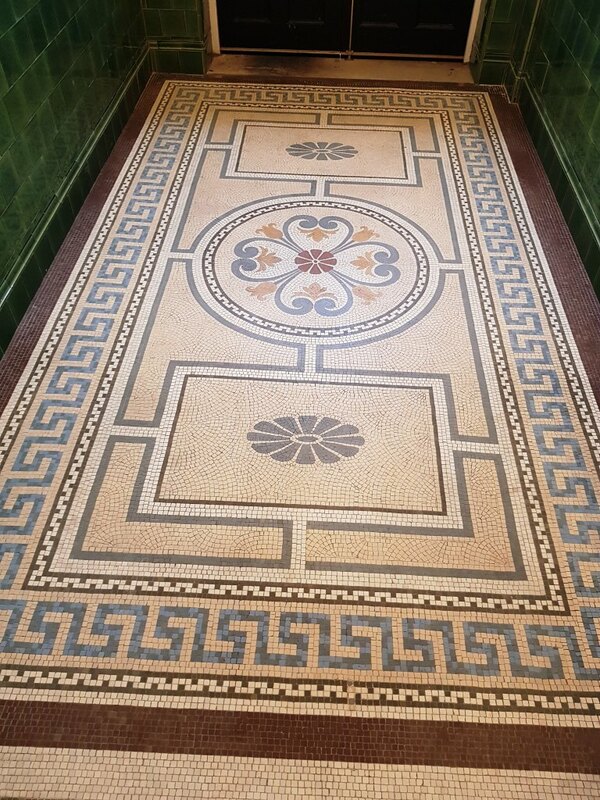 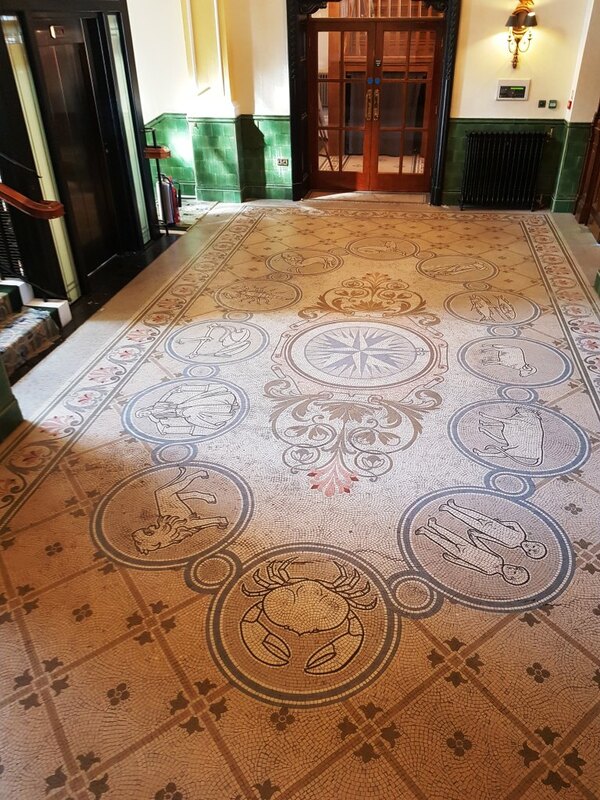 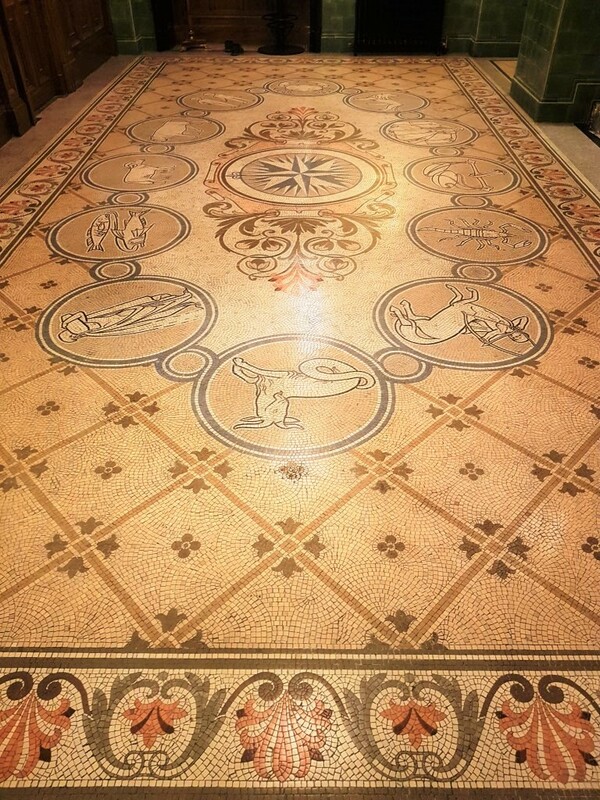 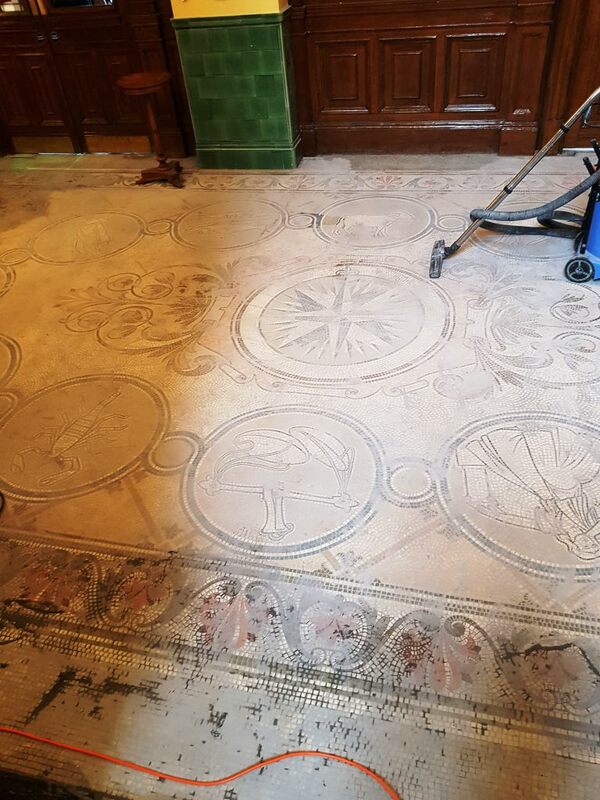 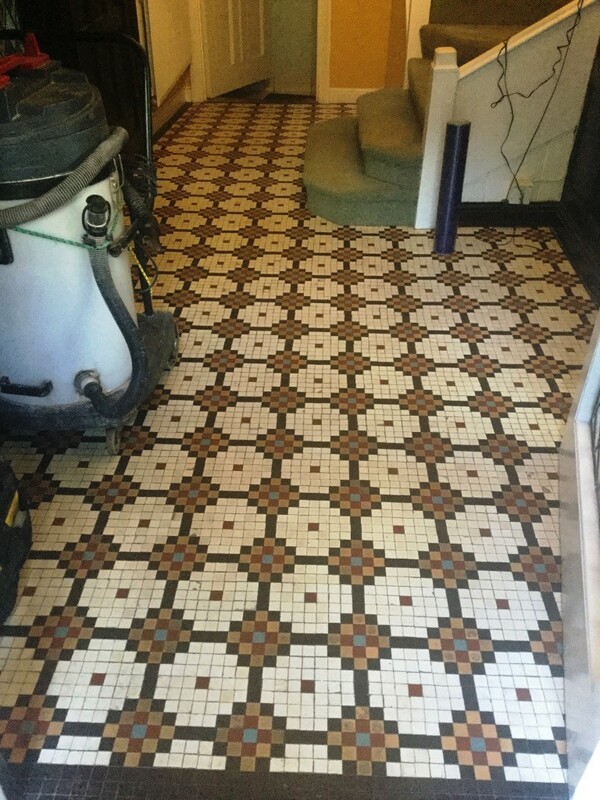 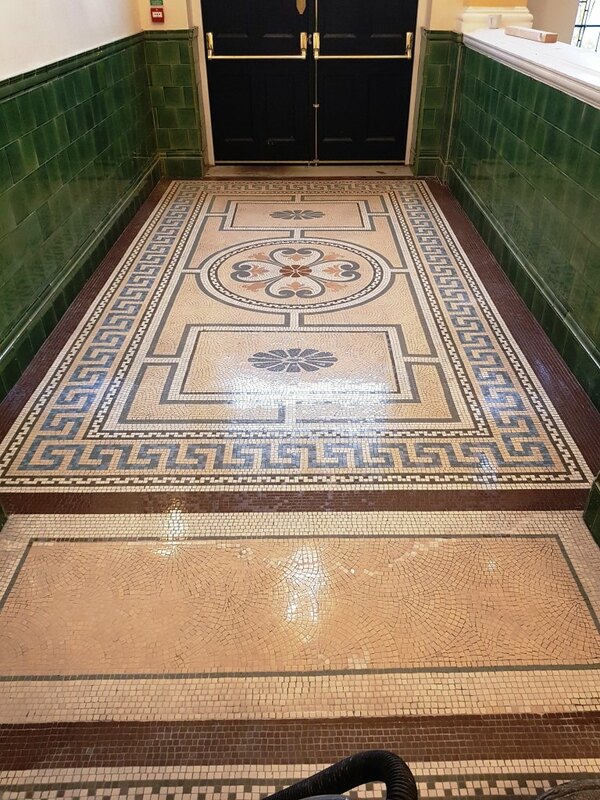 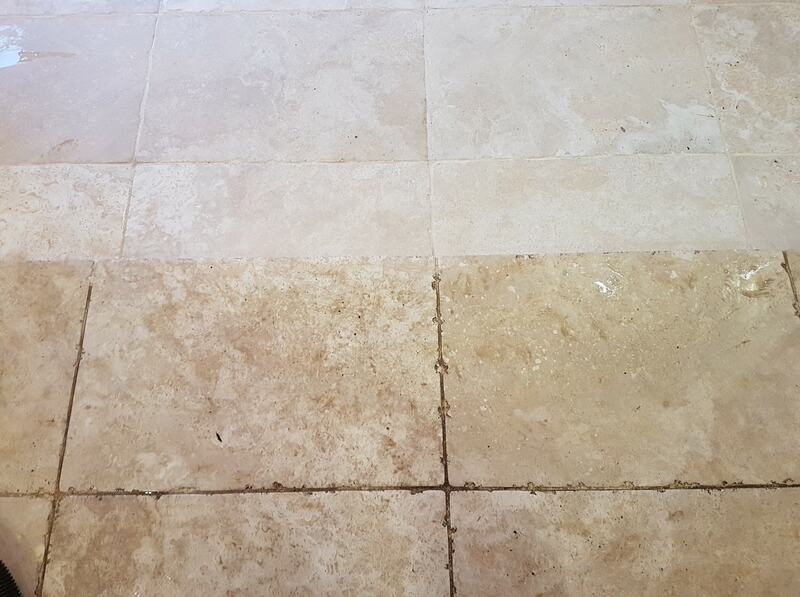 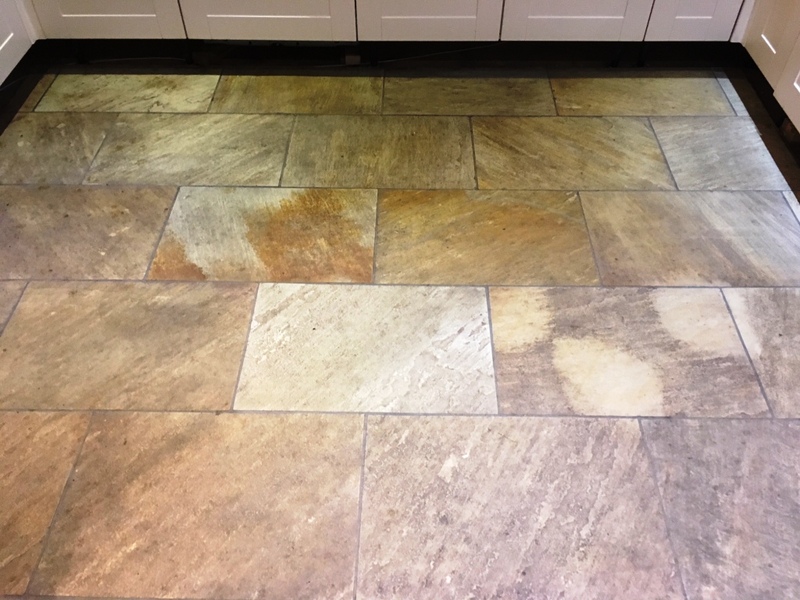 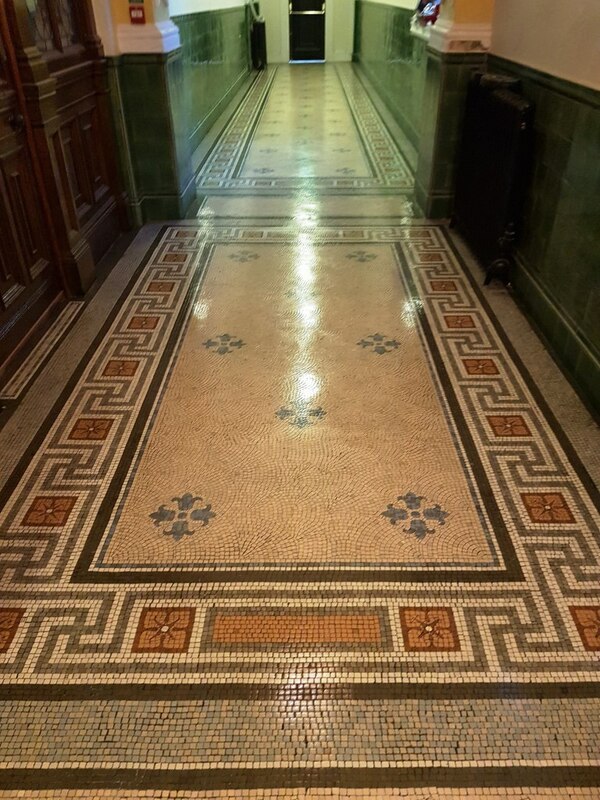 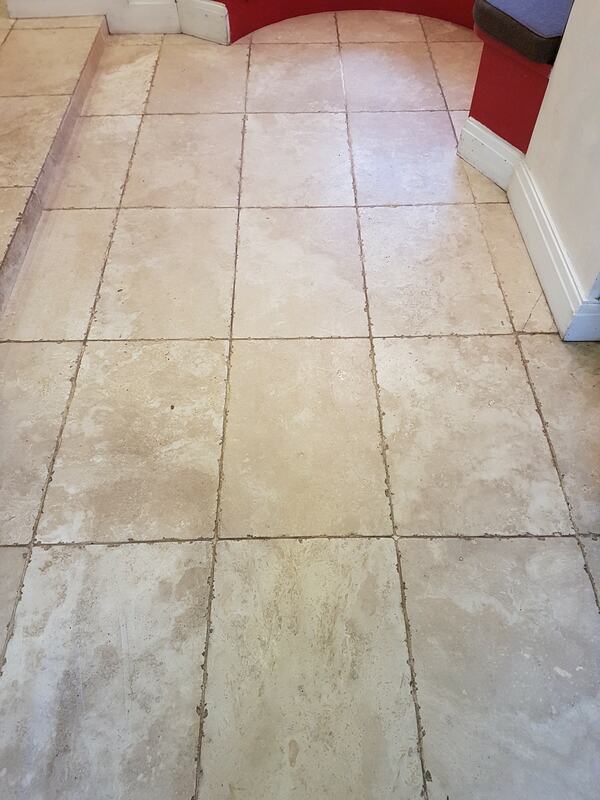 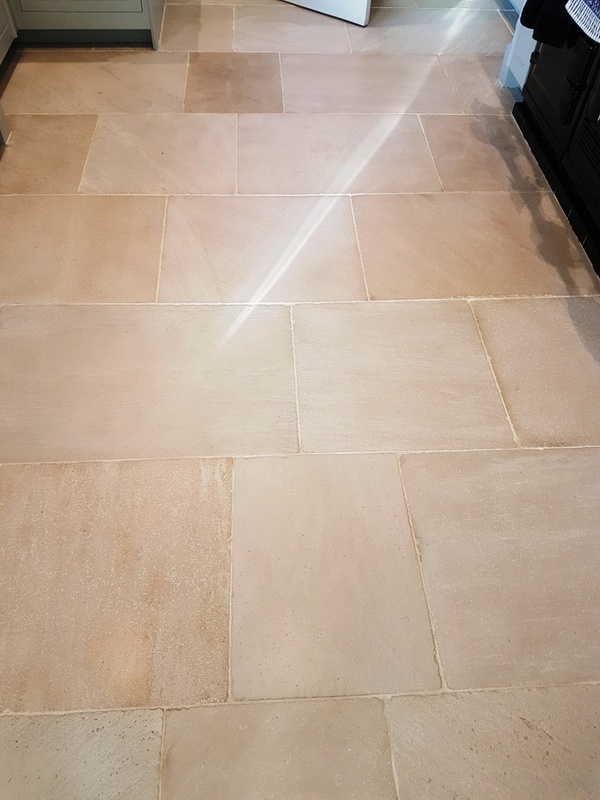 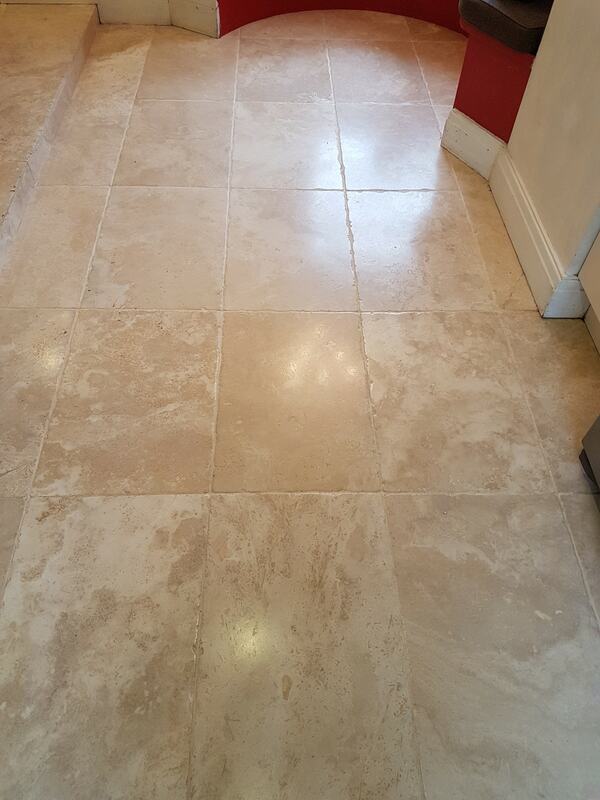 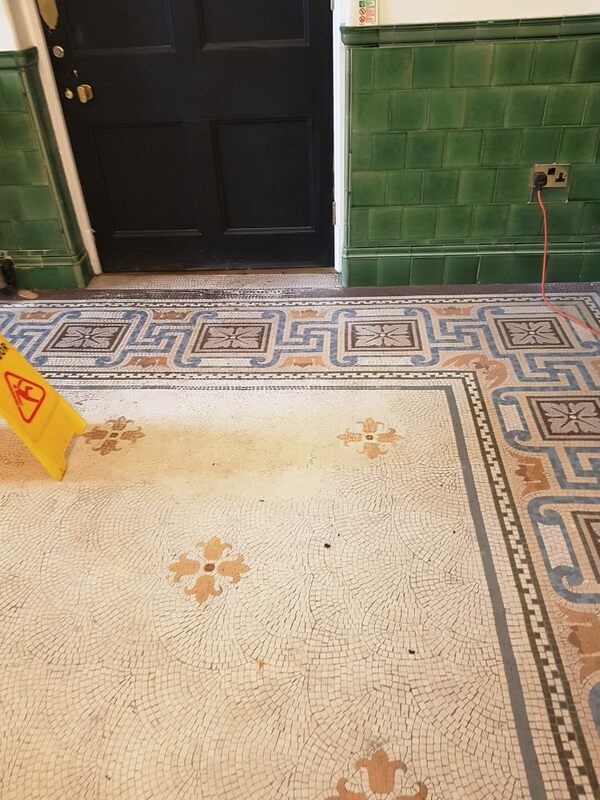 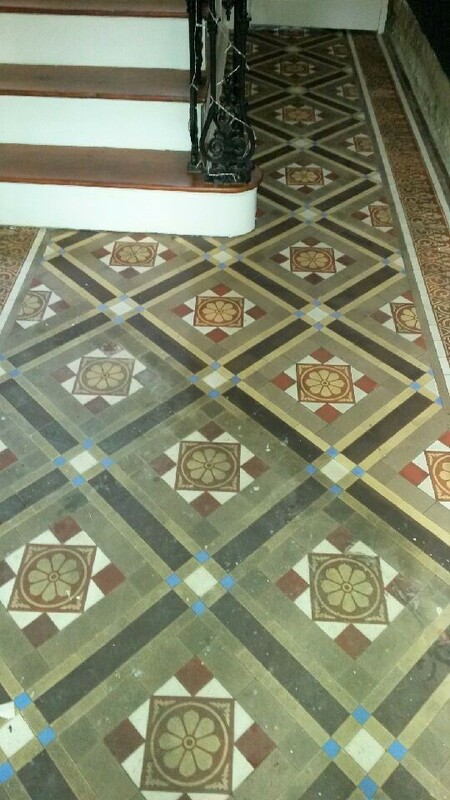 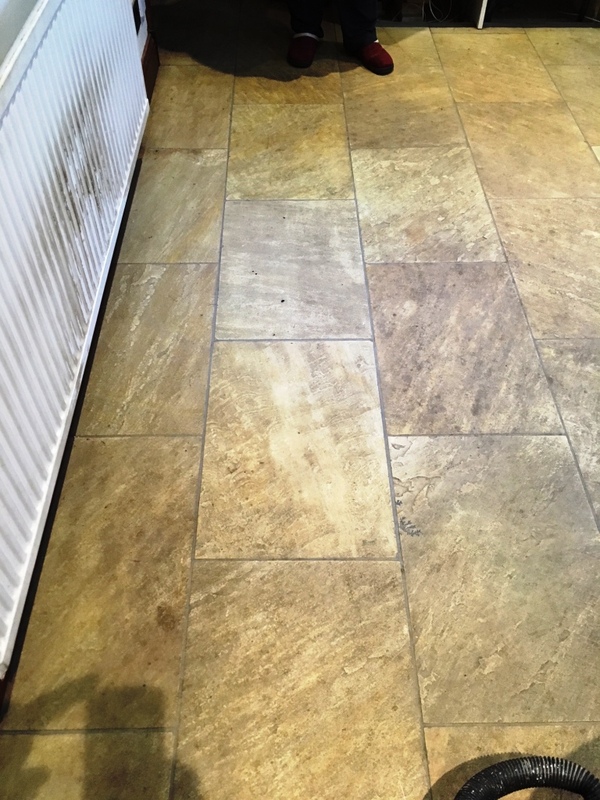 The client was very happy with the finish and thankful for the maintenance advice that will help them maintain their beautiful stone floor in good condition.